Without entering into the merits of these two judgments, against which the Commission has brought separate appeals, the General Court’s judgment in the Spanish Tax Lease (STL) case deserves special attention, for it contains also interesting developments on the links between the separate notions of advantage and selectivity, and the need for the Commission and for the EU courts to pay special attention to the identification of the correct beneficiary when dealing with State aid schemes involving multiple layers of actors. According to the Commission in its Decision (recital 19), this tax gain was initially collected by the EIG and its investors but was then partially kept by the investors (at a level of 10-15 %) and partially (at a level of 85-90%) passed on to the shipping company which in the end became the owner of the vessel through a 20% to 30% reduction on the initial gross price of the vessel. 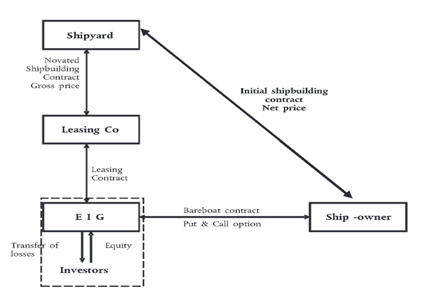 The Commission was faced with the difficulty of identifying the beneficiary undertakings of the STL regime in this case, as it acknowledged that it was in principle possible to identify 5 major categories of actors: (i) the shipyards offering new built vessels or construction, repair and renovation services, (ii) leasing companies offering financing facilities, (iii) EIGs chartering out and selling vessels, (iv) the investors in those EIGs offering goods and services on a wide range of market (except if they are individuals not exercising any economic activity, in which case the Commission recognised that they were not covered by the Decision), and (v) shipping companies offering maritime transport services buying vessels to the EIGs through the STL system (recital 126). Firstly, in its assessment of the STL system as a whole, the Commission ruled out that the STL regime could provide a selective advantage to the shipyards, as it could not establish that the STL “was de facto limited to the acquisition of Spanish vessels”. The Commission also indicated that the Spanish tax administration confirmed that the STL regime also applied to ships built in other EU Member States. Under these circumstances, the Commission concluded that the STL entails no further element of selectivity to the benefit of Spanish shipyards and no discrimination on the place of establishment of the shipyard (recital 160). However, a few recitals above, the Commission found that the STL as a whole was selective as it conferred discretionary powers and as the tax administration would only authorise STL operations to finance sea-going vessels, which would amount to sectorial selectivity (statistics showed that all of the 273 STL operations organised until June 2010 concerned sea-going vessels). We will come back to these findings, as they are at least implicitly questioned in the judgment of the General Court. Secondly, the Commission found that the advantage of the STL accrues to the EIGs and by virtue of the principle of fiscal transparency deriving from the legal status of EIGs under Spanish law, to its investors. Indeed, the EIG is the legal entity that applies all the tax measures and, where applicable, the one that files requests for authorisations with the tax authorities. From a tax perspective however, the EIG is a tax transparent entity, which means that its taxable revenues or deductible expenses are automatically transferred to its investors, in proportion to their shareholding (recitals 28 and 161). The Commission therefore concluded that the tax benefits resulting from the operation are shared between EIGs and/or their investors and the shipping companies. Whereas other participants in STL transactions such as shipyards, leasing companies and other intermediaries benefit from an indirect effect of that advantage, the Commission considered that the advantage initially collected by the EIG/investors was not transferred to them (recital 163). As far as shipping companies were concerned, the Commission considered that the economic consequences beyond the grant of the tax advantage to the EIGs resulted from the combination of legal transactions between private entities, so that any advantage accruing from the STL to those undertakings was not imputable to the State. Indeed, the applicable rules did not oblige the EIGs to transfer part of the advantage to the shipping companies, even less to the shipyards or to the intermediaries. Hence, the selective advantages flowing to the shipping companies (and a fortiori to the shipyards and to the intermediaries) were not granted through State resources, following the Commission’s appraisal (recitals 169-170). In sum, where an economic advantage could be found at the level of five different groups of operators, the Commission considered that only the EIGs and their investors benefited from a selective advantage flowing directly from State resources. Shipyards and shipping companies did also benefit from an economic advantage, albeit not one which was selective or directly granted through State resources, according to the Commission. It is important to bear in mind however that, while the Decision recognised that both the EIGs and its investors benefited from State aid (article 1), the Commission ordered the aid to be recovered at the level of the investors only, “without the possibility for such beneficiaries to transfer the burden of recovery on other subjects” (article 4), which is, as the Commission itself acknowledged, quite an unusual requirement (recital 199). It seems that the General Court strongly disagreed with this approach, as it transpires from several findings of the judgment. As a starting point, the GC took care to distinguish between the advantages granted to the EIGs and to their investors. At paragraph 116 of the judgment, which is a key paragraph in its reasoning, it stated – quite bluntly – that according to article 1 of the Decision, if the EIGs have indeed benefited from the three fiscal measures composing the STL regime, it is only the members of these EIGs (i.e. the investors) that have benefited from the economic advantages deriving from it. In order to support this finding, the GC based itself on recital 140 of the Decision, where the Commission found that, because of the tax transparent status of the EIGs, which enables different operators to join and finance any investment or carry out any economic activity, the tax status of the EIGs under Spanish law did not confer any selective advantage to the EIGs or to their members. The GC deducted from this finding that the fiscal advantages granted to the EIGs could only have benefited their members, the so-called “investors”, which were also the only entities targeted by the recovery order in article 4(1) of the Decision. Therefore, the GC found that the Commission wrongfully concluded in article 1 of the Decision that the EIGs had also benefited from a State aid within the meaning of article 107(1) TFEU. This conclusion could have been developed in more detail, as it is pivotal in the remainder of the GC’s analysis on the notion of selectivity, in which it only examined whether the investors had benefited from a selective advantage, without considering the situation of the EIGs any further in that respect. Indeed, it is one thing to argue – as the Commission did at recital 19 of the Decision – that, according to the principle of fiscal transparency, the economic advantages initially received by the EIGs in the form of tax benefits are then transferred to its investors and to the shipping companies. It is quite another thing however to deduce from this fact that the EIGs never received an advantage in the first place, and are therefore not the beneficiaries of State aid. After all, only the EIGs constituted under Spanish law could benefit from the tax benefits accruing from the STL regime (see recitals 15-19 of the Decision). Moreover, even if the Commission’s recovery order is phrased in quite unusual terms, in that it imposes the recovery of the aid at the level of the investors, “without the possibility for such beneficiaries to transfer the burden of recovery on other subjects”, such a factor should not in itself be decisive in order to determine whether the EIGs benefited from State aid or not. Indeed, the Commission can sometimes decide – and is legally entitled to do so – that there is a State aid but, for reasons of legitimate expectations  or for other reasons such as the difficulty to calculate the exact amount of aid , conclude that nothing should be recovered at the level of a particular beneficiary. This does not mean automatically however that this beneficiary did not receive a State aid if all the conditions of article 107 TFEU are met. Arguably, in the present case the Commission could not order the integral recovery of the State aid both at the level of the EIGs and their investors, as this would amount to recovering the same thing twice. Whilst the decision to recover at the level of the investors only and not at the level of the shipyard or at the level of the EIGs can be questioned, it is essentially a matter of recovery of State aid – for which the Commission has a certain margin of discretion but needs to comply with general principles of EU law – and not of existence of aid as such. If we accept as a starting point the summa divisio between EIGs and investors, the reasoning of the General Court is quite easy to follow: the possibility to invest in a particular EIG was open to all enterprises in all sectors. Therefore, the mere fact that the fiscal advantages were granted on the condition of investing in particular goods, to the exclusion of other goods or other type of investments does not render them selective insofar as those investors are concerned (para. 143). The judgment quotes, in that regard, the recent judgments of the General Court in Banco Santander and Autogrill. It also distinguishes, in a very pedagogic and useful manner, several precedents that were invoked by the Commission in order to ascertain the selective character of the STL regime, such as Germany v. Commission , Associazione italiana del risparmio gestito and Finco Asset Management/Commission, Le Levant 001 a.o./Commission, Spain/Commission, Italy/commission and Diputación Foral de Álava e.a./Commission . Basically, the General Court explained that in all those cases involving indirect aid, the Commission never found that there was a selective advantage and therefore a State aid at the level of the individual investors, but rather at the level of the companies ultimately benefiting from those favourable investment conditions. In the present case, it is true that the Commission did not find that the shipyards benefited from State aid. The Commission however found that two sets of operators benefited from a selective advantage, namely the EIGs and their investors. While the reasoning on the absence of selectivity at the level of the investors is understandable, especially when applying the more recent criteria developed by the General Court in Banco Santander and Autogrill, it is rather puzzling though that the GC assumes that there could be no selective advantage at the level of the EIGs, because the Commission did not identify an indirect advantage that would flow from the fiscal advantages granted to investors having shares in those EIGs (para. 153). It seems that such reasoning turns the whole STL regime upside down. In fact, as the Commission stated in its Decision and as the General Court recalled at paragraphs 8 and 21 of its judgment, the fiscal advantages were directly granted to the EIGs and, by way of fiscal transparency (see above), to their investors. That advantage was then partially kept by the investors and partially transferred to the shipyards (recital 19 of the Decision). The investors could thus only benefit from the favourable tax regime by investing in an EIG, and were not – as the General Court’s reasoning suggests – acquiring fiscal benefits themselves that they were further transferring to the EIGs. This approach leads to the easy conclusion that, taken separately, neither the EIGs nor the investors benefited from a selective advantage, when it is not entirely clear why the EIGs did not benefit from an advantage in the first place. The GC shifted the debate on selectivity from the EIGs to the investors only when, even applying the reasoning in Banco Santander and Autogrill, it is quite obvious that the STL regime was not a priori open to all undertakings operating in all sectors, because only EIGs constituted under Spanish law doing a particular STL operation were eligible to obtain the fiscal advantages provided under the STL regime. In that sense, the STL is selective in that it favours certain undertakings which are in a comparable factual and legal situation in the light of the objective pursued by the measure at issue. Thus the GC seems to draw an artificial distinction between EIGs on the one hand, which would not have benefited from an advantage, and their investors which, although they benefited from an advantage it was not a selective one because it was open to all of them. When reading the Commission’s Decision carefully though, it appears that the EIGs and their investors are always taken together as one and the same undertaking within the meaning of Article 107 TFEU. On the other hand, it could be argued that the Commission has itself created this situation of uncertainty by clearly separating the EIGs and its investors in its Decision when ordering the recovery of the aid at the level of the investors only. However, as has been explained above, it should in principle be possible to consider the issue of existence of State aid and the issue of recovery of State aid separately. In such a case, the Commission should carefully explain why it could not order the recovery of the aid at the level of the beneficiaries it has initially identified as benefiting from a selective advantage, and hence, from State aid, namely in the present case the EIGs and the investors taken together. Arguably though, similarly as for standard competition cases, the Commission cannot order to recover the aid at the level of an undertaking, which is sometimes composed of different legal entities – but at the level of individual companies, which are the only legal persons identifiable under national law. The question remains as well as to why the Commission didn’t recover the aid at the level of the shipyards or the shipping companies directly. As the GC pointed out, the initial complaint was brought by shipyards and at least one shipping company complaining of unfair competition with Spanish shipyards benefiting from the STL regime (para. 1 and 199 of the judgment). The Commission also acknowledged in it Decision that the STL system allowed shipping companies acquiring a new ship from a shipyard to benefit from a rebate of 20 to 30 % of the initial price of the vessel, with 85-90% of the tax gain initially collected by the EIGs and their investors being passed on to them (recital 19 of the Decision). The Commission’s reasoning on selectivity is that the advantage to the shipping companies did not flow directly from the STL regime (it was not compulsory under Spanish law for the EIGs and the investors to transfer the tax benefit they initially obtained) but rather from a combination of legal transactions between private entities. The condition of State resources not being met, there was no State aid for shipping companies, according to the Commission. Needless to say, the Commission lodged an appeal against this judgment, as well as against the other judgments of the General Court in Banco Santander and Autogrill. It will be very interesting to see how the Court deals with these difficult issues of selectivity and the identification of the beneficiaries in fiscal State aid schemes. Para. 49 of the Banco Santander judgment and para. 45 in Autogrill. Para. 65 of the Banco Santander judgment. And para. 61 in Autogrill. The STL system is in fact composed of 5 different measures, namely (1) the accelerated depreciation rule (Article 115(6) of the Spanish Tax Law on Corporate Tax (TRLIS)); (2) the discretionary application of early depreciation (Article 115(11) TRLIS and Articles 48(4) and 49 of the Spanish Regulation on Corporate Tax (RIS); the tax status of EIGs (Article 48 and 49 TRLIS); (4) the Tonnage Tax system (Articles 124 to 128 TRLIS); and (5) a rule according to which certain sea-going vessels that would normally be regarded as used or second hand upon their transfer into the Tonnage Tax system are deemed to be new (Article 50(3) RIS). See recitals 21 to 42 of the Decision for a detailed description of those measures. See recital 11 of the Decision. For an example, see the Commission’s Decision on the Belgian coordination centres (Decision of 13.11.2007 in Case C 15/2002, OJ L 90, 2.4.2008). For an example, see the Commission’s Decision of 2 August 2004 on the on the State Aid implemented by France for France Télécom (Case C 2004/3060, OJ L 257, 20.9.2006, p.11). See, inter alia, Banco Santander, para 33. It is quite clear that the STL scheme and the fulfilment of its conditions was not open to all companies but was designed in such a way that only EIG’s constituted by a bank were eligible to the fiscal advantages. It is interesting to note as well, in this respect, that the GC found that the Commission should have given more indications as to how such a scheme would have conferred an advantage to the investors – and not to the shipyards or shipping companies – that would be liable to distort competition and to affect trade between Member States within the meaning of Article 107 TFUE (para. 200 of the judgment). See, to that effect, Case T-538/11, Belgium v. Commission, EU:T:2015:188, para. 124, and the Opinion of AG Bobek on appeal, released on 21 April 2016 in Case C-270/15 P.
 See, in that respect, Joined Cases C‑106/09 P and C‑107/09 P, Commission/Government of Gribaltar a.o., EU:C:2011:732. Hi Sebastian. It’s always interesting to read other people’s view on one’s cases (disclaimer: I am one of the lawyers representing the large majority of investors that appealed the decision). I also have to congratulate you for the unusual courage/independence of criticizing a Judgment from your own Court that is subject to appeal. I think that -regardless my disagreement with the content of the comment- it is good and enrichening to the legal debate that people have such independence. EIGs could have never received a tax advantage under the corporate income taxt (the advantage identified in the decision) because they are not subject to the corporate income tax. It’s quite obvious that a non-taxpayer could never benefit from a tax advantage! They therefore didn’t transfer a tax advantage to investors, they only transferred losses which could then be turned into tax advantages by tax investors depending on their individual circumstances. The Commission was of course aware of this (as its decision shows), which is also why it did not order the recovery from EIGs as there was nothing to recover. If you ask your then colleagues at the State aid team of the Legal Service they should confirm this point. The General Court only, and logically, took into account the reality. But I’m open to the debate. In order to claim -as you do- that EIGs were beneficiaries, it would seem natural to first identify what is the advantage they receive, right? So, in your view, what would that advantage be? I suppose you are serious, so happy to reply. -First, the Commission actually examined the tax transparency of EIGs (i.e. the fact that only the members and not the EIGs are subject to taxes) in the decision and it explicitly came to the conclusion that it implies no State aid (read para. 140 of the decision). It is therefore clear that this is not the advantage the Commission attributed EIGs in this case. -Second, there are EIGs in every Member State and fiscal transparency applies to all of them. There are also quite a number of Court’s rulings involving EIGs. Since you question my knowledge of the case-law, I would ask: do you really know of a singe Judgment in which it was established that their not being directly subject to the corporate tax rule is an advantage? -Third, this should go without saying, but the reason you won’t find any Judgment validating your creative proposition is because its widely accepted that the fiscal transparency of EIGs is justified by the logic of fiscal systems. -Fourth, if what you were saying were correct, then how would you explain Article 40 of Regulation on the European Economic Interest Grouping (EEIG), which provides that “The profits or losses resulting from the activities of a grouping shall be taxable only in the hands of its members”. As the latter provision shows, not being subject to the corporate income tax had nothing to do with the STL and is not even special to Spanish law. It is the rule not only in every Member State, but also under EU Law itself. So, since this cannot be an advantage (much less an advantage derived from the STL), let me ask again, just to make sure. Your whole comment is about how you think EIGs should have been considered beneficiaries of the advantages deriving from the STL. What is the advantage that you think they received from the STL? advantage corresponds to the sum of the advantages reaped by the EIG by application of the selective measures identified above, i.e. You cannot argue one the one hand that the investors could deduct losses obtained by the EIGs and pretend on the other hand that the EIG never obtained an advantage in the first place! If you say that State aid law has to look at effects and economic reality, I think this is clearly the case here, otherwise any investor can hide behind a structure like an EIG in order to obtain State aid ! -All provisions and “advantages” cited in that paragraph are contained in theTRLIS and the RIS (rules on corporate income tax – Impuesto de Sociedades or “IS”) to which, again, EIGs are not subject, so the alleged advantage could have never benefitted them !! The fact that they didn’t receive the advantage is again confirmed by the fact that the Commission could nor order the recovery of any advantage from EIGs. -And surely one can argue that EIGs never obtained an advantage in the first place even if investors were to have receive one. That is because EIGs only incurred losses (I hope we agree that a loss in itself can never be an advantage), and those could only be turned into tax advantages by their investors when paying corporate income tax and only in some (not all) cases. -As to the argument that investors can hide behind these structures, well, no. If there is a selective advantage at the level of investors then the Commission will be perfectly able to identify it as State aid. There are several examples, but take the one of the decision concerning the GIE fiscaux in France, which also refers to investors receiving aid through the same sort of entities, subject to fiscal transparency as well. Even though no one claimed the GIEs obtained an advantage, the Commission was able to find State aid at the level of investors). As that case shows, EIGs cannot therefore be used to hide from a State aid that exists. My contention here is only that they cannot be used to create a State aid that doesn’t exist. Also, the decision did have its day in Court, and it was (rightly) annulled ! In any event, I appreciate that you took interest in this case which is indeed interesting. 1) If we can agree that the advantage only materializes at the level of investors, then I’m good with that. The General Court never said there was no advantage for investors, what it said was that the advantage was not selective, and therefore there was no aid. 2) You make an interesting point on whether this favoured shipyards or not. The Decision said it didn’t (admittedly, the opening decision said the contrary) and for some reason decided to focus only on investors, where obviously no “certain goods or undertakings” were favoured. But I do agree that the General Court’s Judgment (in the case brought precisely by shipyards) may arguably contain elements which would seem to lend suppport your view, contrary to the one advanced by the Commission’s decision. Also, if that were the case and you were right, the error concerning investors would be even greater, as the decision forced them to give back the advantages that would have benefitted others. 3) Glad to see another point of agreement. So, after all, we (the General Court, you and me) npw seem to agree much more with each other than with the decision !